Until now, if you wanted a camera that could shoot video with the deep colors, enhanced light sensitivity, and shallow depth-of-field achievable with large-sensor imaging, you had one of two options: an ungainly DSLR kitted out with any number of expensive support accessories, or access to a large bank account. The AG-AF100 not only delivers the image quality, versatility, and control that professional shooters have been clamoring for, but at a price well within most pro-level budgets. No doubt about it: the large-sensor, interchangeable lens camcorder has finally arrived. The AG-AF100 series is the first professional HD camera recorder to adopt the Micro Four Thirds standards. These standards were announced in 2008 as an extension of the Four Thirds standards for DSLR (Digital Single Lens Reflex) cameras. Panasonic and some other manufactures have already released a number of digital cameras and interchangeable lenses based on the Micro Fourth Thirds standards. The "Four Thirds" name is derived from the 4/3-type (approx. 17.3mm x 13mm) image sensor. The size of the image sensor, the standardized lens mount developed for it, and interchangeable lenses designed exclusively for digital cameras form the core of the Four Thirds standards. These standards were established to offer an optimal solution for digital cameras, breaking loose the confines of film camera standards. In establishing the Micro Four Thirds standards, the flange back distance (the distance from the lens mount surface to the image sensor) was reduced by about half and the mount diameter was made about 6 mm (0.24 inches) smaller than that of the Four Thirds mount. The image sensor size is the same as that of the 4/3 type used in the Four Thirds standard. The Micro Four Thirds standards have made it possible to reduce the size and weight of cameras and lenses, and to achieve greater interchangeability of lenses together with video recording capability. The 4/3-type MOS image sensor in the AG-AF100 series has about the same imaging area* as that of 35mm cinema film. The depth of field and the focal range are also close to those of film cameras. With the AG-AF100 series, you can record beautiful, shallow depth of field, film-like images. The MOS sensor has two control lines as compared to the three lines required by a conventional CMOS sensor, thus providing a larger light receiving area. This has achieved a high level of sensitivity rivaling that of a CCD sensor. Extensive noise reduction measures are also employed, such as embedded photodiodes isolated from noise sources and low-voltage operation. By guiding more light to the pixels, the AG-AF100 series achieves a wide dynamic range and detailed gradation with minimal blocked shadows or blown highlights in high-contrast scenes, for true-to-life textures and rich colors. *The effective imaging area is trimmed to a 16:9 aspect ratio. The AG-AF100 series' optical low-pass filter is optimized for HD motion images and reduces the aliasing noise that often occurs in motion images captured by an image sensor with a high pixel density. In addition, the MOS image sensor is scanned at a high speed in order to minimize skew distortion. The AG-AF100 series is equipped with a high-performance 18-bit digital signal processor (DSP) for image processing. Optimized for HD video recording, the DSP handles various image rendering processes, such as dynamic range stretch (DRS), gamma, 12-axis independent color correction and detail enhancement, as well as conversion to HD/SD video formats−-all with exceptional precision and high image quality. The AG-AF100 series has an internal neutral density (ND) filter that is essential for video recording. The dedicated dial on the camera body lets you adjust the setting in three steps (1/4ND, 1/16ND, and 1/64ND) with any type of lenses. DRS recognizes the average brightness of highlight and shadow areas and then automatically adjusts the aperture and uses knee control to suppress blocking in the shadow areas. In scenes with mixed dark and light areas, DRS automatically provides a wider dynamic range with minimal blown highlights and blocked shadows. Drawing on technologies developed for the VariCam, Panasonic has equipped the AG-AF100 series with advanced gamma functions that address seven different shooting scenarios and enhance your creative abilities. This includes tow cine-like gammas, which produce the characteristic warm tones of film recordings. Other gamma settings include HD Norm, Low, SD Norm, High, and B.Press. - Color setting with matrix table: Norm 1, Norm 2, Fluo and Cine-Like. - Adjustable H detail level, V detail level, detail coring and skin detail. - Adjustable chroma level, chroma phase and master pedestal. - Adjustable color temp: 2400K to 9900K (preset 3200K/5600K). - Knee point settings: Auto, Low, Mid and High. The AG-AF100 series uses the AVCHD recording format and also supports the high image quality PH mode. AVCHD complies with MPEG-4 AVC/H.264 High Profile, the latest motion picture compression technology. Boasting a compression efficiency that is more than twice that of the MPEG-2 system (such as HDV), this advanced video file format delivers superb image quality and low data rates. 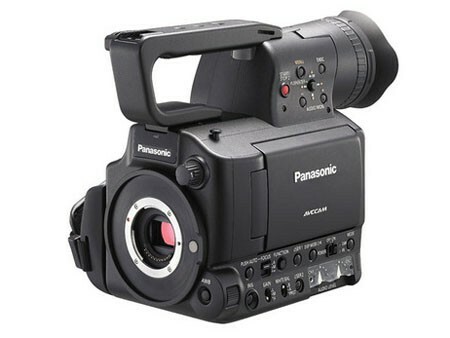 The PH mode was developed for AVCCAM by Panasonic exclusively for high-quality professional video production. This mode boasts a maximum AVCHD bit rate of 24 Mbps (average: 21 Mbps) and records 1920 x 1080 full-HD images. The PH mode supports uncompressed 16-bit LPCM 2-channel digital audio recording for high-quality sound in addition to Dolby Digital 2-channel audio. The HA/HE mode employs Dolby Digital 2-channel audio recording only. The AG-AF100 series has inherited and further advanced the acclaimed functions of the VariCam, which is widely used in producing movies, TV programs and TV commercials. The new Variable Frame Rate (VFR) function* supports full-HD (1920 x 1080) progressive mode. Armed with a 20-step undercrank (lower frame rate)/overcrank (higher frame rate) function, the AG-AF100 series is capable of producing cinematic images such as a 1/2.5x slow-motion effect and 2x fast motion effect when played in 24p mode. *Cannot be played in 1080/60p mode. 720p VFR not supported. Class 6 or higher SDXC/SDHC/SD Memory Card is required for VFR recording. The AG-AF100 series supports the new SDXC Memory Card. The SDXC Memory Card is a next generation large-capacity data storage device with upgraded versions of the file system (FAT) and physical specifications of the SDHC Memory Card. Thanks to a large storage capacity, which exceeds the 32 GB limit of the SDHC Memory Card, the SDXC Memory Card can handle large data volumes of 48 GB or 64 GB. It also boasts a high maximum data transfer speed of 22 MB/s* and a wide operating temperature range of -25 to 85C (-13F to 185F). The AG-AF100 series can also use the SDHC and SD Memory Cards. This Kit includes the Hot Rod PL mount, the Hot Rod PL Support Chassis and the Hot Rod X-Baseplate, and allows use of all 35mm PL mount lenses on the Panasonic AF100 safely and securely. This is the only PL mount system for the micro 4/3 format that features a professional shimmable flange; this feature is a 100% requirement in order to have accurate lens focus marks.